“What a terrific group. I could certainly sense the team bonding that this group of Sales, Marketing, Customer Service and Quality had amongst themselves. It was great to see this within an organisation. Well done to Caspak in arranging this Packaging Training.” Mr Pienaar said. “Each attendee received a thorough set of notes covering all topics discussed; where in the quietness of their own time they can re-read to take it all in. I was pleased to see how well all attendees understood the content, which at times can be challenging.” He said. As a part of the training Caspak staff could raise their own questions providing real-life examples. These interactive and dynamic discussions were stimulating and encouraging. Pierre closed the training by summarising the elements gained during the day: new theoretical knowledge, problem solving skills, practical application, the power of teamwork and technical knowledge. Each attendee was asked to leave the training day and evaluate how best they would apply their new learning and in what timeframe. The true success in such training is to have a follow-up session in 6 months to see how each individual has applied their gained-knowledge and to see what more can be done over the following 12 months. Amanda McIntyre is to be commended for pursuing and obtaining approval to run such an effective, important event; tailored specifically to Caspak and their needs. 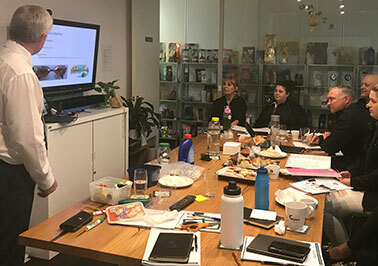 Caspak have committed to two more training sessions with the AIP over the next 12 months to ensure that their staff are trained in all areas of packaging.